The studio is currently planning to publish the game for multiple platforms: PC & Nintendo Switch. Maintaining an optimal, consistent, and ergonomic controls for different ports is very important. Since they are planning to release more ports in the future, I decided to create one universal controller interface instead of creating different controller images for each consoles. This interface can be found under settings for controller configuration where players can map the key layouts. If players are unsatisfied with the current controls, they can change it to their needs. I also created a controller layout document that contains controller mappings of different consoles, which serves as a guide for the programmers to map these functionalities to each key of the controller. "There is not much variation on the characters' personalities, would be more interesting if I could talk to different kinds of people in this game"
We had an issue in writing the story when the character's personalities are too similar. My role during my internship doesn't include being a writer for the game, but I could give suggestions on how to create a diverse cast based on their personalities. My suggestion was utilizing MBTI (Myers Briggs Type Indicator), a system of how people perceive the world and make decisions which is heavily based on the conceptual theory proposed by psychologist Carl Jung. The Myers Briggs Type Indicator Scale (MBTI) might not be the best tool for identifying a real person's personality type since it lacks identifying cognitive functions, but I find it as a great tool for fictional character creation. We created a table by mapping out each characters with their desired personality. It turned out to be a great approach in outlining different character personality types. After mapping out each character's personality, we decided to create an alignment chart where the characters are seen in a more general perspective from their emotional tendencies and decision making. This is a great approach to see a bigger picture of the characters' personalities. You might ask why the characters who don't appear in the demo are shown as silhouettes? The character designs & roles might change throughout the development, but eventually you will see them soon after the release date! "Was very confused about what I was expected to do at the beginning, would have been useful to have some directions to the brewing station better." A tutorial system is useful for navigating new players to understand concepts of the game. A lack of tutorial would cause new players unable to play the game properly. I have an idea of executing the tutorial as a diegetic monologue of the barista and pointers for navigating the buttons. A tutorial system that utilizes diegetic monologue would be perfect for this game because it retains the immersion through in-game narratives instead of a regular tutorial of how-to-do-tasks. Just for early-game brewing sessions, the recipe for the drinks are shown in a monologue as a "training wheel" for new players. 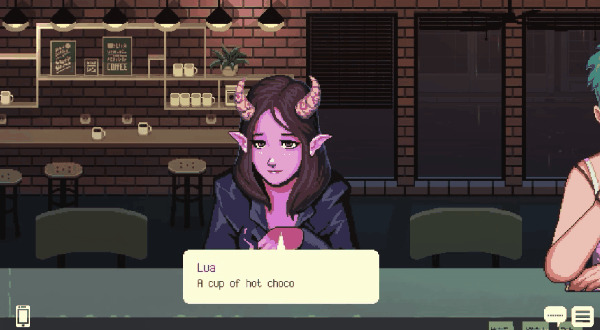 Eventually, the recipes for all drinks are not shown in a monologue because experimentation is a part of the gameplay. Unfortunately, I couldn't finish this task because my internship time is over. "Talk about soothing games! Makes me feel like everything can be solved by combining the right ingredients into a warm beverage, & I want more!" "This was a cool game so far! Great job! It is really chill to play with a great premise! The writing, art style, and music all fit together nicely." "This game is relaxing and has a great storyline about the characters and the city!" I am also quite surprised that the game got featured in an article on Kotaku, Rock Paper Shotgun, and Paste Magazine. Toge Productions was also invited to attend 4 international game conferences, including PAX West & Busan Indie Connect. Unfortunately, due to some circumstances, the game cannot be showcased this year. On the contrary, the game is currently participating as an entrant in Indie Games Festival 2019. Choosing an internship in an indie game studio over a bank company was the best decision I made this summer. While other friends of mine can brag about how big the company they are working for, I am really grateful that I was working with a lot of friendly and inspirational people. I got the chance to apply my UX research skills and provide feedback for high quality upcoming games before they are released. I learned the best practices in creating a well-structured script organization in Unity, a technical art preference guide, and a comprehensive game design document. I also learned a lot about game development & production, not just in theory but also how the industry works. When it comes to building user interfaces in games, not only functionality or aesthetics come into play. It needs to convey an experience that fits the atmosphere with determined stylistic choices. I wish them good luck in brewing this astounding interactive visual novel. For updates, you can follow Toge Productions & Coffee Talk on Twitter. Please take a shot of our serving by downloading the recent demo on Steam or itch.io! Now, I have to finish my degree in the US for my last semester, as I'm still stuck in a limbo of indecisiveness between getting a Master's degree or finding a full-time job here as an international student which is difficult.